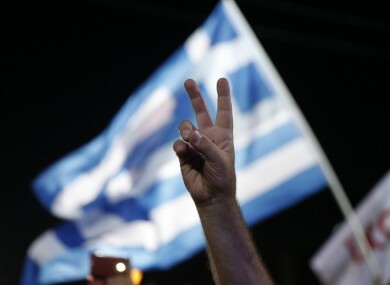 THE GREEK PUBLIC are casting their vote in a referendum that could be make or break for the embattled nation. Opinion shows public opinion is evenly split between the Yes and No – or Nai and Oxi – camps. Voting Yes means Greece receives more bailout funds, but in exchange for more austerity. The EU favours this side, as it will likely result in the most stability for the country and Europe’s economy as a whole, at least in the short term. Voting No means rejecting what the country’s leaders have called ‘humiliating’ bailout deal from international creditors, denouncing it as ‘terrorism’, but it could also see the country forced out of the eurozone. We want to know what you think: Should Greece accept the terms of a new bailout? Email “Poll: Should Greece accept the terms of a new bailout?”. Feedback on “Poll: Should Greece accept the terms of a new bailout?”.